Lost Planet squared. That's what Capcom want us to call their latest dip into the universe of E.D.N. III, snow pirates and giant bugs. Taking place ten years after the original third-person action shooter Lost Planet, the frozen planet of E.D.N. III has thawed. Warring factions are fighting each other and the supersized Akrid bugs for control of the planet's thermal energy, which is used to power just about everything. Lost Planet 2, producer Jun Takeuchi says, is bigger in nearly every way, but is it better? 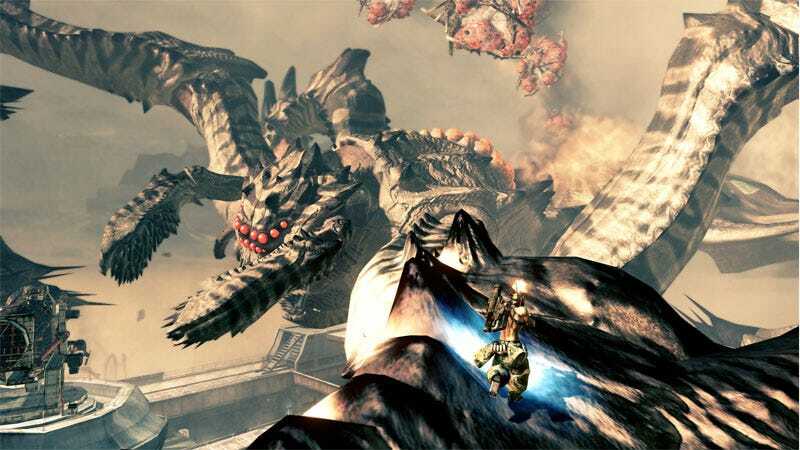 With Akrid so big you can climb into them and shoot your way out, more Vital Suits, more weapons, more factions and no more life-robbing sub-zero temperatures, how can Capcom go wrong? Let's see. Cooperative Play: Lost Planet 2 doesn't just allow you to play through the six episode campaign with a friend, it nearly requires it. Not only does the game support local two-player split screen gaming, but you can also go online and bring in up to three players to help you through the campaign. And there are plenty of interesting cooperative moments in the game. You can, for instance, have a buddy repair your armored Vital Suit while battling, or rely on them to unfold a three person shield to provide mobile cover. There's even a Vital Suit that can hold three people: One controlling the mechanized suit and two in shoulder-seated gunnery positions. Great fun. Bigger Weapons, Bigger Bugs: The developers of Lost Planet 2 say the "2" after their game's name actually means it's squared—squared because everything about the game is bigger. The two things that seemed to grow most this time around are the planet's hostile insect Akrid and the absurdly large guns you use to squish them. The weapons have gotten so big this time around you'll need two trains to carry some or a space station to fire them off. And the Akrid are so large that you can crawl inside them and battle your way through their intestines, taking out their vital organs and smaller Akrid, while your coop buddies continue to plug away at the monstrosity from the outside. These super-sized weapons and enemies add a sense of scale to Lost Planet 2 that will be hard to top. Suits: The best part of Lost Planet 2, by far, are the Vital Suits. They remain one of the more interesting elements in the series. And, as with the rest of the game, the Vital Suits are much more fun this time around when you've got a buddy with you. Many of them allow a player to grab onto a handle and cling on as the suit stomps its way through a map. The best of the suits this time around is the GAF-15D, wearable armor that carries three gamers, allowing one player to control the suit and fire auxiliary weapons while two other players control larger shoulder-mounted weapons. It's even more fun during the online matches. Character Design: The character design in Lost Planet 2 is so absurd, so over the top that you can't help but eventually fall in love with it. For me, that happened around the fifth episode when I was introduced to the Vagabundos and their low-rider sandbikes. These shirtless sand pirates all seem to wear spike-festooned cans on their heads with a single eye-hole to see out of. While their bizarre attitude and out of left-field jokes were refreshing, they actually aren't the most interesting looking characters in the game. You've got the Carpetbaggers, the New NEVEC soldiers, mercenaries and the Snow, Desert and Jungle Pirates, all vying for most outlandish costumes and ornate head gear. Every time you go into battle, it's a visual feast. I'm surprised any fighting gets done. Harmony: Gone is the need to constantly monitor your thermal energy as you wade your way through the hip-deep snow drifts of a frozen planet. The planet of E.D.N. III's new climates, which include deserts, jungles, and even a bit of snow, mean that your thermal energy doesn't slip away automatically and you can now use that orange glowy stuff you collect to power a harmonizer that will heal your character. To activate it you have to sit still and hold in the start button as your health slowly drifts up. This adds an interesting new element to gun fights. Epic Confusion: Lost Planet 2's story gets lost in the sheer size of everything that's going on in the game around it. Over the course of six episodes, you take on the role of a soldier in nearly every faction on the planet, each with its own story and motivation. The game ultimately manages to tie all of those loose strings together, but it's a stretch. The end result is a bloated, confusing story that lacks personality and any plot devices that will pull you through the episodes. Idiot AI: There's more than one reason you're going to want to play through Lost Planet 2 with a friend or friends. Playing on your own means you have to rely on up to three of the biggest idiots found in gaming. These guys will stand statue still as they absorb clip after clip of bullets. They'll refuse to help you complete mission-ending objectives that are nearly impossible to finish on your own. They'll even disappear at times, as if the three of them ran out to buy a six pack of beer, leaving you to blow the building-sized kneecaps off the latest Akrid horror to dig its way out of the ground and into your path. Cooperative gaming should be a choice, not a necessity. To make matter worse, the enemy AI was blessed with the sort of intelligence that borders on psychic. Somehow predicting when you would pop your head out of a train door, or building and timing shots from across a map to kill you instantly. This is most frustrating on a level about halfway through the game. A level that was so long, so peppered with control and AI issues that it could cause people to just give up on the campaign entirely. Loading Walls: Just when I thought we had gotten past invisible walls in games, Capcom comes up with a new and more frustrating use for them: Loading screens. Often they don't even bother to hide these loading walls behind a bit of sensible graphics. Instead, you'll be walking through a jungle, or winter scape when you see a red line on the ground and a few feet later you're just unable to proceed until the countdown hits zero. Funky Split:I'm a big fan of split-screen gaming, but don't even ponder playing Lost Planet 2 with a friend without an oversized TV. That's because Lost Planet 2 goes out of its way to not use all of the space it can to show gameplay. Instead of splitting the screen in two, the game creates rectangles of gameplay in opposite corners of the screen and then fills the considerable black space left over with rather small maps. Bizarre. Grappling with Grapple: The grapple ability of Lost Planet 2 is tons of fun, but man is it glitchy. I lost so many lives and had to restart so many levels because my grapple decided mid-zip to stop and drop me to my death. These glitches sometimes had to do with walls, or blocking objects, but more often than not it was a random, painfully annoying occurrence. I decided not to list online multiplayer as either a loved or a hated, that's deliberate. While playing the game in multiplayer matches online is fun, it doesn't rise to the level of supplanting any of the things I felt needed to be pointed out about the game, both good and bad. Lost Planet 2 online will likely find its supporters, but its no Modern Warfare 2, MAG or Halo: Reach. I ended up playing through Lost Planet 2 nearly one and a half times. First playing through more than a third of the game with my son cooperatively using final, but not retail code, on the Xbox 360. Then finishing the campaign completely on the PlayStation 3 on my own. It's a fun game, but it's also a frustrating one. The minor issues taken alone don't seem so bad, but in a few chapters they manage to pile up in such away as to nearly destroy the experience. That's unfortunate, because plenty of what makes Lost Planet 2 so much fun, the grappling and gunning, the vital suits, can't be found in very many shooters. Lost Planet 2 was developed and published by Capcom for the PS3 and Xbox 360 on May 11. Retails for $59.99 USD. A copy of the game was given to us by the publisher for reviewing purposes. Played through the entire campaign alone on the Playstation 3. Played through a chunk of the campaign cooperatively on the Xbox 360. Played multiple matches online with the Playstation 3.